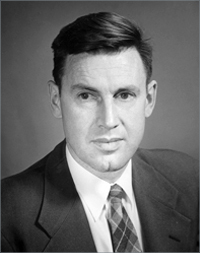 Robert Christy was a physicist who worked on the Manhattan Project during World War II and designed a plutonium implosion device for the first nuclear bomb. Later in his career, he also studied cosmic rays and pulsating stars. His institutional affiliations included University of British Columbia and California Institute of Technology. May 14, 1916Birth, Vancouver (B.C.). 1935Obtained BA, University of British Columbia, Vancouver (B.C.). 1937Obtained MA, University of British Columbia, Vancouver (B.C.). 1941Obtained PhD in Theoretical Physics, University of California, Berkeley, Berkeley (Calif.). 1941 – 1942Instructor in Physics, Illinois Institute of Technology. 1942 – 1943Researcher, Chicago Metallurgical Laboratory, Manhattan Project, Chicago (Ill.). 1943 – 1946Researcher, Los Alamos Laboratory, Manhattan Project, Los Alamos (N.M.). 1946 – 2012Assistant Professor to Professor (1946-1986); Chair of the Faculty (1969-1971); Vice President and Provost (1970-1980); Acting President (1977-1978); and Emeritus Professor of Physics (1986-2012), California Institute of Technology, Pasadena (Calif.). 1965Member, National Academy of Sciences. October 3, 2012Death, Pasadena (Calif.). Both employed at the Chicago Metallurgical Laboratory, Manhattan Project. Both employed at California Institute of Technology and Los Alamos Laboratory, Manhattan Project. Chair of the Faculty; Vice President; Provost; and Acting President. Assistant Professor to Professor and Emeritus Professor of Physics. Researcher, Chicago Metallurgical Laboratory and Researcher, Los Alamos Laboratory. Obtained BA in 1935 and MA in 1937. Obtained PhD (Theoretical Physics) in 1941. Manhattan Project videohistory collection [videorecording], 1987-1990. Bruce H. Morgan lecture notes, 1953-1954. Foundations of electromagnetic theory / John R. Reitz, Frederic J. Milford, Robert W. Christy. Noted Physicist Robert F. Christy Dies. Robert Christy Physics Today obituary. Robert F. Christy 1916-2912, Biographical Memoirs of the National Academy of Sciences. Robert F. Christy, Atom Bomb Physicist, Dies at 96.